The city of Beaune calls itself the capital of the Côte d'Or, the world-famous Burgundy wine area. As you approach Beaune from any direction the moniker seems accurate, since you drive through hectares and hectares of some of the most valuable vineyards producing some of the most prestigious wines in the world. 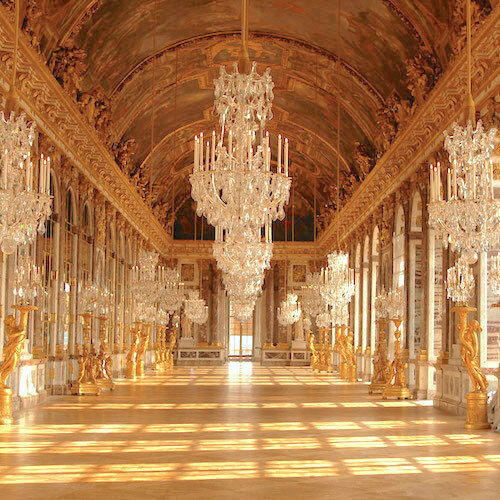 Nowadays, the Côte d'Or is also famed for a number of superb restaurants, stretching from Dijon in the north to Chagny in the south. Beaune is at the heart of this gourmet belt as well. 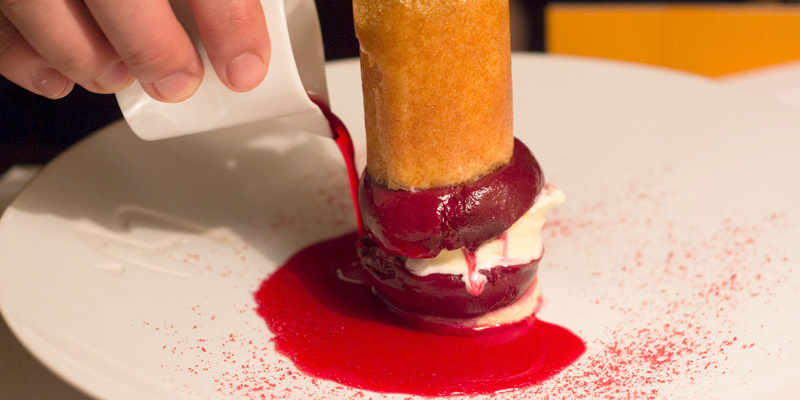 Four of the region's Michelin-starred restaurants are in Beaune, but there is one restaurant that stands out in this exclusive group, for Le Benaton features some of the best cooking we have ever come across. The chef is a heavyset man with a thrush of dark brown hair and a wide mouth. He looks like he's just finished a rugby match and, in fact, Bruno Monnoir has played a fair amount of the game. But, since 1990 he and his wife Isabelle have been playing another game — chasing Michelin stars. Despite his manifest mastery in the kitchen, Chef Monnoir waited 16 years for his one Michelin star. "I wasn't the man who takes the train," chef says of his sixteen years in the wilderness. "I was the man who stays at the station and watches the train go by." In 2006, a star finally fell on him. "It was magic!" Bruno exclaims, his dark eyes lighting up. Immediately, tables at the restaurant were booked up; they had to turn diners away. Chef tells us he's like Obelix, he fell into the magic elixir that gave him cooking powers from a young age. He started cooking at age 6 and by 9 had made his first boeuf Bourguignon. In a strange turn of fate, his parents had a pizza restaurant in the same building Le Benaton now occupies. 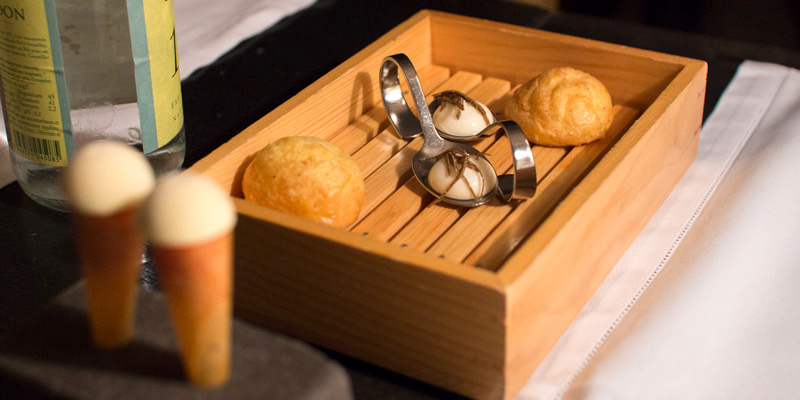 In a small wooden box arrives a perfect arrangement of two warm gougere puff pastries. Next to them are two spoons with curled edges meant for easy handling, with a small orb of truffle cream, a delicate shaving of truffles on top. The truffle cream explodes in the mouth, releasing the soft, delicate truffle flavour. Along with this box of goodness is a granite brick with two holes carved in in to hold playful cones. Looking like miniature ice-cream cones, they are made of a fine parmesan crust, the "ice cream" is a savoury tomato-mustard concoction. Judging by the clever and delicious amuse bouche we are in for a helluva meal! A small round loaf of bread, cut into six pie pieces. The butter is served on a cold white stone with a beautiful knife sliced right into the butter. Perfect. Served in a large white bowl is a carpaccio of beef wrapped around haddock in a fabulous foamy broth. Topped with a crumble of smokey, porky bacon. It's a clever dish and very satisfying. Foie gras de canard anguille fumée cassis comme une "pomme d'amour"
A ball of foie gras with a black currant exterior is served on a grid of yellow dots, which are a kumquat sauce. It actually looks like an candied apple, with the glossy red exterior created from cassis sauce. It's beautifully cooked with a light smoky flavor heightened by the fish. Two small pieces of smoked eel on the side. The "apple" is also accompanied by a light brioche. This is a beautiful plate and an original way to prepare foie gras. "Unbeeeelievable," we note cleverly. Tête de veau rôtie grosses langoustines frites au son de moutarde de Mr Fallot, bouillon mousseux gribiche. 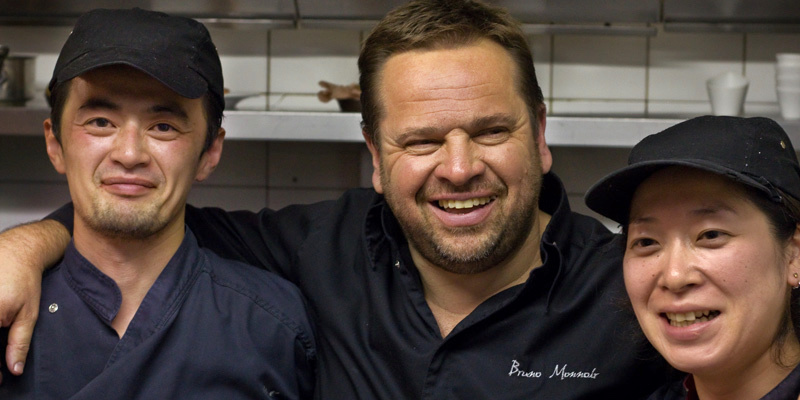 Chef Brunos says he's a big fan of mixing sea and earth flavours together a la surf & turf or in French, mer & terre. And he shows his stuff in this creative and satisfying dish. We can see why this is a signature dish. The large square, white plate with a small bowl holds the majesty of earth and sea; a small cake of tête de veau that has been roasted, reduced, and most likely confited. It almost looks like a dark ginger cake. The cake rests on a foamy sauce with a hint of Dijon mustard and a sprinkling of herbs. A large, langoustine (la mer), crispy and tattooed with a spice melange, is skewered with a bamboo pick to the the veau (la terre). 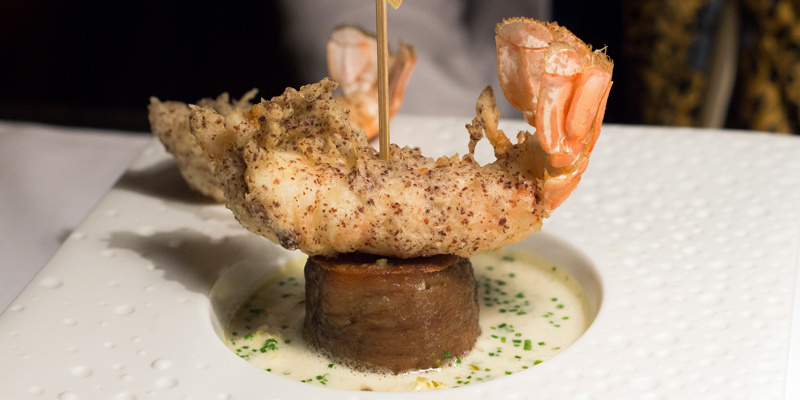 Another langoustine, with its distinctive u-shape, is placed outside the bowl, on the edge of the plate. The arrangement is a bold statement; all the components are large with minimum of fuss. There's something almost caveman about it, one large protein skewered to another protein. The langoustines are plump, with a crispy exterior and a supple, juicy flesh. If you think Michelin-star food is fussy, think again. This has all that luscious flavour appeal of your local deep-fry. This is the sort of food that brings comfort to mind. The broth is lightweight, frothy, and gives a sharp and exciting dimension to the dish. Chef Monnoir is playing with food again. This gribiche is based on a classic French sauce made by emulsifying hard-boiled egg yolks and mustard with oil. The sauce is traditionally finished with chopped pickled cucumbers, capers, parsley, chervil and tarragon, and is typically served with boiled chicken, fish, tripe or tête de veau. Chef plays with with this classic sauce by adding Fallot mustard (which is produced in the area — "Mr Fallot" — their shop just down the street) and keeping the texture and taste refined. Salmon with a crusty skin made from buckwheat flour, with fennel, lemon custard quenelle, one white flower and one dill leaf. The fish is delicately and perfectly cooked. There are a surprising mix of flavours in this dish: salmon, lemon curd, and a little delicate wisp of a slice of fennel. It's the best salmon we've ever eaten and the cooking is phenomenal. It's like a Canadian West Coast restaurant in heaven. Ora King is a New Zealand salmon that is sustainably farmed and raised with the strictest of strict standards — no growth hormones, antibiotics, or synthetic ingredients. 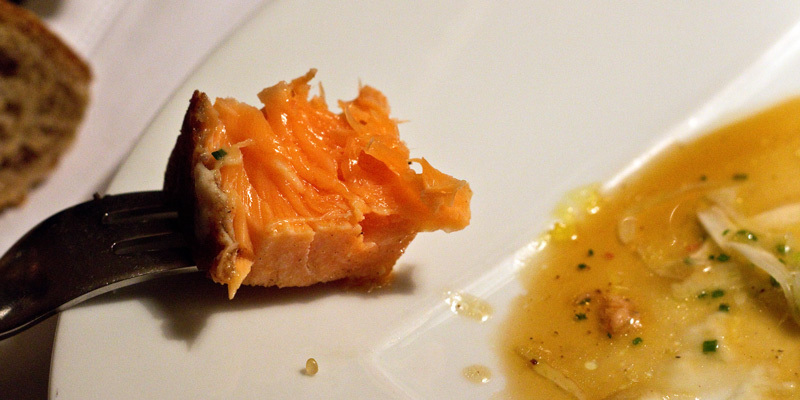 These salmon, appropriately named the Waygu of the Sea, live in luxury until they're harvested. They're bred in pristine spring water then delicately transferred to the Marlborough Sound, being hand-selected as the best of the best. Compared to Atlantic salmon, King salmon are significantly larger in size, richer in flavour, and have a higher fat content (think healthy omega-3 fatty acids.) The higher fat content makes them an ideal candidate for cooking because it keeps the meat moist and inhibits drying out when cooking. The full name of this dish is, Pigeon du Louhanias désosse: filet roti cuisse croustillante comme un paella poulpe et safran de Bourgogne, elevange de Mr. Michon en Bresse. Let's just get this right out of the way — pigeon du Louhannais refers to pigeons that are raised by Monsieur Michon who happens to reside in Louhans, a small commune in the Saone-et-Loire department in the region of Burgundy. The village is centrally located on the plains of Bresse with a population of 6,950. Monsieur Michon is one of them. 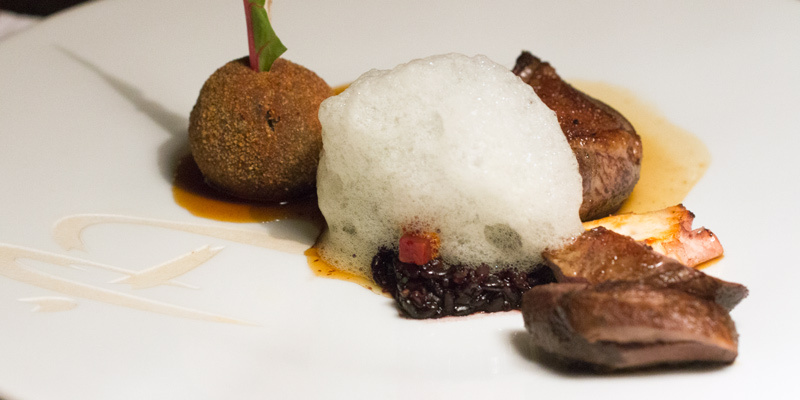 The slightly more traditional main course features half a boneless pigeon, a crispy thigh, and another crunchy ball that is constructed with confit of pigeon. 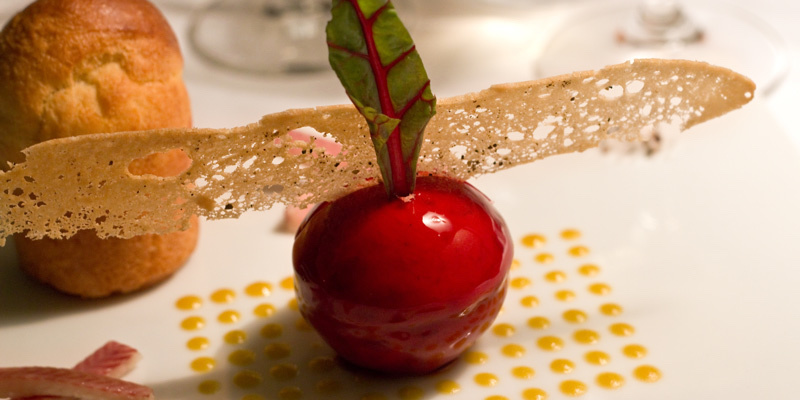 To serve as the "apple" stem, a single leaf of beet juts out of the crunchy ball of goodness. On the side is a reconstruction of the thigh and the giblets, breaded and fried to crispy perfection. The pigeon is served medium-rare with incredible accuracy; it's perfectly cooked all the way through. The meat is flavourful, but it's the contrast of textures that really make this dish a workhorse. For on top of Chef's version of paella is a light and frothy pale foam with the vaguest flavour of saffron. A truly perfect main course that illustrates once again the talents of this kitchen — they can also create classic dishes with exceptional products. A whole peach, poached in red wine, is red all the way through. This dish looks futuristic — the peach is cut into halves, filled with cream, then reformed and positioned on the plate with something like cement. On top of the peach is a phyllo tower, filled with cream, and a red berry sauce is poured around it all. Don't try this at home, folks. Just enjoy it here. Comme un vacherin fraises mara des bois au balsamique, pulpe de banane, mascarpone glace. This dessert is inspired by another classic French dessert, vacherin, which is a meringue crust filled with Chantiily creme. Mara des bois is a variety of strawberries grown in France; the brick-red, cone-shaped berry has the full-bodied taste of woodland berries. This dessert is a softball-size white ball accompanied by a single strawberry surrounded by three strawberry dots that presages what's inside the ball, a hint of what's to come. Crack open the meringue ball and find strawberry and banana cream inside. It's the best meringue we've ever had. After twenty-six years, ten of them with a Michelin star, Chef Bruno recently turned over the kitchen to his assistant of ten years, Chef Keishi Sugimura. (Also in the top photo.) But not much has changed at Le Benaton — in the latest edition of their restaurant guide, Michelin says, "Keishi Sugimura, the longtime second of Bruno Monnoir, is now alone in the kitchen. But be assured: the beautiful regional products and the creativity are still the program! The setting blends elegant wood and stone with a lovely terrace overlooking a Japanese garden."